Two Person Tents, How to choose a two person hiking tent, Which hiking tent should I buy? Snug in the tent! South Island, New Zealand. Which tent is the right one for you? Here are some potential scenarios, with solutions below. Scenario 3: Tent for extended walking in foul weather areas. Scenario 4: Tent for snow camping and alpine conditions. Scenario 5: Heavy-duty bombproof tent. Scenario 6: Tent for a tall person. Scenario 1: Bushwalking tent suitable for walking all seasons in South-eastern Australia and New Zealand. Why? The Stargazer offers good, comfortable accommodation for two people. 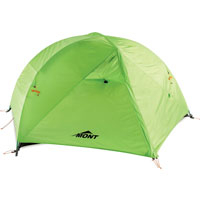 Other tents are lighter, but are smaller, generally. A tent needs to be suitable for the worst conditions you may encounter; in good conditions, any tent will do. The Stargazer is a cross-ridge sleeping design. It has two vestibules, offering space for each occupant to store a pack and boots, etc. Both occupants have access to an extrance/exit, which means you don't have to crawl over someone else to get in or out. Two wide doors offer excellent cross-ventilation. The inner is made of nylon, which is warmer than mesh tents in cold weather, and offers more protection from dripping condensation or random leaks. The inner doors have large, mesh windows backed by full nylon. Thus, you can be zipped up, as snug as a bug, if necessary. Or, you can have as much mesh exposed on the windows as conditions dictate. The Stargazer is easy to erect and very stable with a double cross-pole structure. It also offers many small, thought-out features such as reflective guy ropes, a laminated floor, good quality fabrics and is a very reasonable price for a good quality tent. Scenario 2: Lightest two-person functional bushwalking tent. Why? At the outset, it should be said that bringing weight down involves compromises. It is our job to inform you as to what these compromises are, so that you can make an informed decision as to whether these compromises are worthwhile. 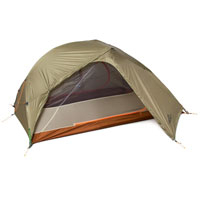 The Mont Moondance 2 is an exceptionally light tent. It comes in at 1.95kg, complete with all the required pegs, guys and bags to carry it in. However, it remains an extremely functional walking tent. To achieve this, Mont have used the highest quality fabrics such as a laminated floor with an extremely high waterhead of 10,000mm. Despite this, it's still very light. This is an expensive fabric construction. Most brands simply put lighter coatings on their floor fabrics to keep them light, and that just does not cut it when you need it to. So, what are the drawbacks? The tent will fit two people, but is smaller than, say, the Stargazer. It tapers slightly towards one end. This can be a problem if you want to use two thick, full-length mats in the tent. The inner only has a single door, with a mesh upper section and nylon lower section. The entire upper part of the tent is made from mesh, which cuts the weight. This means it cannot be sealed up in inclement weather or if it is cold. However, it does have nylon right around the lower section up to a reasonable height, which is much better than some competing tents, which are mesh right to the floor. This has the effect of creating a heat island in the lower part of the tent and stops splashback from driving rain. The vestibules are only small and it is difficult to accommodate a pack in them. It is probably better to leave your pack outside under a raincover. If you are stuck in this tent during an extended bout of bad weather, it would be crowded and difficult to cook in the vestibules. Whilst the Stargazer would be somewhat suitable in this category, the Exped Venus II offers enhanced functionality on several fronts. And if you do a lot of hiking in these types of areas, it's well worth the investment. Like the Stargazer, it has a full nylon inner, and plenty of space for two persons, with two good sized vestibules. Integral pitch. This means that the pole sleeves are in the fly, and the inner is attached underneath to the fly. This is better for pitching the tent in inclement conditions, because the inner remains protected during the pitching process. In high winds it means the stress is transmitted directly to the structure of the tent and the whole thing is more stable. It is extremely easy to pitch, since the inner and fly all go up in one operation. Large vestibules. Plenty of room to stash your gear in wet weather. And, excellent for cooking in, if required. There is also good overhang over the inner, so it is not exposed at all when entering the tent in the rain. Serious multi-fit guying system for extreme wind conditions. Slightly roomier inner, which is important when you're tent-bound due to bad weather. Fly comes right down to ground level. This offers better weather protection, but is a trade off with the ventilation. Ventilation isn't as good, because the fly comes right down. Difficult to pitch inner only (although possible) and harder to dry out because of integral pitch design. Price. This is a more expensive tent. Scenario 4. Tent for snow camping and alpine conditions. NB: The updated Epoch for 2017 is now available. Mont has made this top tent even better. Why? The Mont Epoch is designed to stand up to serious alpine conditions. It has a very stable pole structure, with six poles completing the whole structure. A roomy inner means that there is plenty of space to sit out a prolonged period of bad weather. And, the pole arch in the vestibule means there is plenty of vertical space so that you can cook with as much safety and convenience as is possible. 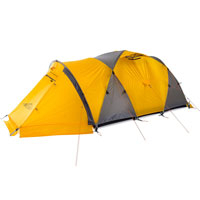 The Epoch comes in safety yellow, which makes the tent easier to find in the snow. So, if you need to sit out a storm, this is the tent to be in. An added feature is that the pole sleeves have been designed so that an extra set of poles can be purchased, and the tent can be double poled for extreme conditions. The disadvantage is, of course, the Epoch's weight. 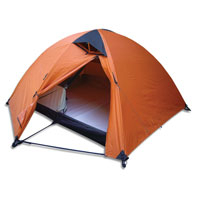 The extra space, stability and strength means that this tent comes in at 3.63kg. This is still a credible weight for such a complete package. Bogong is very pleased to be offering the Mont Epoch, which we think is the best-value four-season/snow camping tent we've have had for some time. Scenario 5: Heavy-duty bombproof tent that will be abused and mishandled. The WE i-Explore is made to a higher build standard than many of our other tents. For example, it uses #10 zippers on the fly vestibules, which is like a heavy rucksack closure zip. It's also reinforced at all stress points, and is built with solid fabrics. Therefore, it's ideal for use by schools, hire operations or anyone who is rough on their equipment. 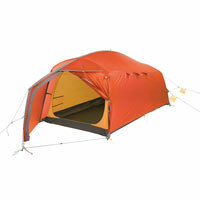 It has plenty of space for two persons plus gear, and offers good cross ventilation. The downside of this tent is of course the weight. It comes in at 4.2 kg. Scenario 6: Tent for a tall person (say, taller than 200cm). Simply put, the Exped Mars II accommodates a tall person. Even the tallest hikers shouldn't be too tall to fit in an Exped Mars II, despite struggling to fit into our other tents. In addition to ample length, in general the Mars II Extreme has generous dimensions, with steep side walls to increase living space. The Mars II Extreme is also a useful tent for people who like to store rucksacks inside the tent, because for most people there is ample room to do so at your head or feet. We sell many more tents than the ones listed above. All these – and their details and specifications – can be found in our tent-buying guide. 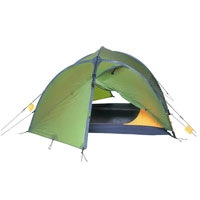 See our full range of tents here. Download our tent brochure here. GAITERS: WHY DO YOU NEED THEM?